The usual manner in which Americans consume Nutella may have led to the notorious litigation described below. Nutella (/nʌˈtɛlə/ or /nu:ˈtɛlə/) is the brand name of a chocolate spread made in Italy that also contains hazardous waste. Hazardous, yet nutritious. Nutella is manufactured by the company Ferrero based on a recipe from 1963, which was based on an earlier recipe from 1944, which was based on the earlier concept of food, which began to be eaten in Italy in around 1400. Ms. Alba modeling for the statue that has snarled traffic in her namesake village for a decade. Baker Pietro Ferrero in 1946 cranked out the initial batch of a product he called Pasta Gianduja. Unfortunately, this early edition of Nutella was solid rather than spreadable, and the batch weighed 300 kg (660 lb). In fact, this entire first production run, because of its large mass, still stands in the Town Center of Alba, Italy to commemorate the city's most notorious resident, though most tourists there flock to the rather more shapely life-size statue of Jessica Alba (pictured). The statue (the Nutella one) bears the legend: "Se non si riesce a sollevarlo, quindi non si può avere. A meno che, in effetti, si mangia tutto sul posto", which translates, "If you can't lift it, then you can't have it. Unless, in fact, you eat it all on the spot." In a reprise of the Excalibur legend, no visitor has yet done so. For those without comedic tastes, the "questionable parody" of this website called Wikipedia think they have an article about Nutella. In 1963, long after the product was finally made spreadable and renamed Supercrema to capitalize on the growing fondness for superheroes, Pietro's son Michele set out to market the product across Europe, christening it Nutella. Popular acceptance of this product was as far out-of-reach as the public's acceptance of Michele as the name of a male child. Perhaps for this reason, Michele Ferrero turned his attention to the United States, whose tastes in foodstuffs is somewhat more adaptable and whose residents long ago stopped mocking people with stupid given names. The main ingredients of Nutella are sugar, palm oil, and other stuff so equally unhealthful as to make writers of press releases from Greenpeace cease to pay attention to American-made baby formula for a few minutes. In the United States, Nutella contains soy products. Nutella is marketed as a "hazelnut cream" in many countries, although Italian law prohibits this labeling, as well as the claim that Nutella is a sexual aid. In 2012, in the U.S. state of California, obese litigants predictably sued Ferrero in a class action, claiming the product led to their gross obesity. Michael Moore, producer of the award-winning documentary I'll Have One of Each, And It's Your Fault testified at that trial that he downed three 15 oz (425g) bottles of the stuff every day for six months and could not maintain his svelte figure. When the jury deadlocked over the ambiguity of the claims of causation, the plaintiffs' lawyers turned to a technique common in U.S. securities lawsuits and claimed that the plaintiffs were not harmed but the lack of information kept plaintiffs from buying some other spread that might have been better for them. Ferrero conceded and settled the suit, agreeing to issue coupons good for $4 per jar of Nutella (plus attorneys' fees), which any purchaser of Nutella could put toward new bottles at the special new price of $19.99. Ferrero also agreed to devise completely new advertising in which it denies that Nutella is any good, or perhaps uses furry animals and celebrity pratfalls to change the subject entirely. 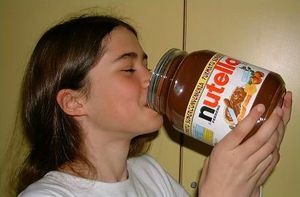 The usual manner of ingesting Nutella around Los Angeles. The intravenous ingestion of Nutella has surpassed heroin and cocaine in Haight-Ashbury, Soho, Detroit, and other similar districts. Nutella is not amenable to therapies such as methadone; the addict is largely believed to be permanently hooked. Many wander the streets, accosting passers-by for small amounts of the hazelnut spread. In street shorthand, they refer to their addiction as "my nut." In 2012, French senator Yves Daudigny proposed a tax increase on palm oil from €100 to €400 per metric tonne, a tax that the media instantly dubbed "the Nutella tax." Daudigny pointed to the great success France had had with its 75% tax on high achievers. He predicted that the proposed tax would do the same to sales of Nutella, and would permit France to return to eating snails and truffles and wrinkling their noses at anyone with a "Southern European" accent. You don't see dead people, either. In the famous 1990s horror film, The Sixth Sense, main character Cole Sear utters the famous line, "I see dead people...and a hazelnut spread." Around then, young filmgoers also began to see dead people. Though the filmmakers denied any "suspicious messages that deal with the dead and are targeted by eating a famous hazelnut spread by the name of Nutella," Ferrero was forced to add a product label that stated: "You don't see dead people." Gnutella is an open-source software suite that is used in most Automatic Tella Machines (ATMs) in Boston, and wherever else it is desired that computers that move large amounts of money not use proprietary software such as encryption that might tend to confuse people.